Sidari has everything you need for a wonderful, memorable holiday without venturing far afield. The town covers all the basics such as cashpoints, supermarkets, gift shops and pharmacists. 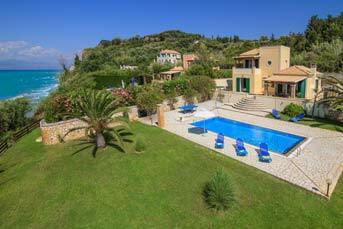 If you want to explore the island a villa in Sidari makes a great base, with local buses to the churches, fortress, shops and hidden leafy squares of Corfu Town. There is a good choice of boat trips from Sidari, and Kassiopi is just a 30 minute drive away. Kassiopi is a traditional village in a magnificent setting with Mount Pantokrator as its backdrop surrounded by olive groves, vineyards and orchards of oranges and lemons. There’s an attractive, horse-shoe-shaped harbour and a fine beach with plenty of water sports on offer. 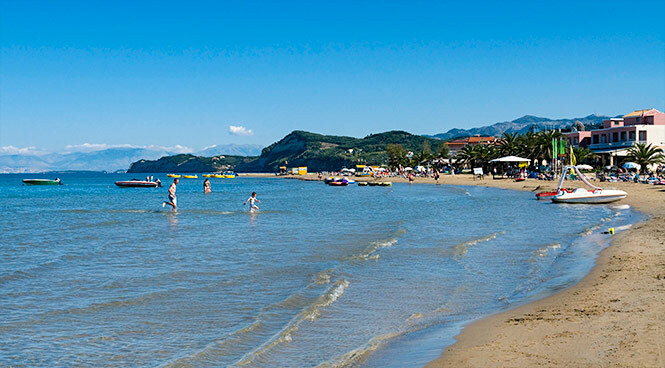 Closer to home, Sidari has several excellent beaches, with great views across to Albania. To the west of the main beach, within walking distance of the town in an area of rugged cliffs and rocks is the famous Canal D'Amour. The “Channel of Love” is 1 of a number of unusual rock formations creating tiny coves and narrow channels, reached by steep paths and in some cases ladders.Sidari has everything you need for a wonderful, memorable holiday without venturing far afield. The town covers all the basics such as cashpoints, supermarkets, gift shops and pharmacists. 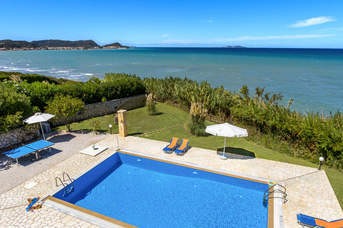 If you want to explore the island a villa in Sidari makes a great base, with local buses to the churches, fortress, shops and hidden leafy squares of Corfu Town. There is a good choice of boat trips from Sidari, and Kassiopi is just a 30 minute drive away. Kassiopi is a traditional village in a magnificent setting with Mount Pantokrator as its backdrop surrounded by olive groves, vineyards and orchards of oranges and lemons. There’s an attractive, horse-shoe-shaped harbour and a fine beach with plenty of water sports on offer. Closer to home, Sidari has several excellent beaches, with great views across to Albania. To the west of the main beach, within walking distance of the town in an area of rugged cliffs and rocks is the famous Canal D'Amour. The “Channel of Love” is 1 of a number of unusual rock formations creating tiny coves and narrow channels, reached by steep paths and in some cases ladders. Sidari is known for its nightlife, but it is also a place of pretty, secluded coves and lovely coastal walks. Calm and shallow waters lap the large sandy beach making it perfect for water sports, including parasailing and diving. You can also try water skiing or paragliding, or hire a speed boat, pedalo or banana boat. There are plenty of sun loungers and parasols on the main beach and beachside bars and cafes to keep you topped up with beer and snacks. There are also several exceptionally lovely little bays with small beaches that are ideal for swimming. The beach at Megali is surrounded by rock pools just waiting to be explored. At the harbour end of Sidari you can hire a motor boat by the hour from the Yellow Boat Company and you don’t need a licence. This is a great way to explore the coast as far as Perulathes to the West and Roda to the East. You can find a greater variety of souvenir in Corfu such as locally made gold and silver jewellery and other craftwork. All kinds of things are made from the local olive wood and there is very good soap made from olive oil,(apparently there are over 3 million olive trees on the island, although we haven’t actually counted them!) Locally made ceramics, lace and embroidered linen are high quality, inexpensive and widely available in Sidari as well as leather belts, wallets and bags. Talking of boats, if you would like to be all at sea with someone else driving, there are some great organised boat trips. You could combine sightseeing and shopping with a boat trip to Corfu Town. The trip takes you along the east coast past Kouloura, Kalami, Ipsos and Dassia and includes a swimming stop at Kerassia. Or try taking a glass bottom boat trip along the west coast to Paleokastritsa, then seeing the Paleo and Vinti caves, stopping at Ermones bay before finally arriving at Paradise Beach for a barbeque. Or you can take a scenic cruise from Kassiopi down the east coast stopping at various locations to swim and sunbathe, visiting the submerged Blue Caves on the way back. If you prefer to be independent, you can take a ferry from Sidari to Erikoussa, a tiny, unspoilt island with a long, crowd-free sandy beach. When you are hungry walk to the old village for picnic supplies. We hear the pies are pretty good!